A Village in Turmoil: Finding Hope for Waterloo ~ The History Girl! Just a few miles from present-day Interstate 80 in Sussex County is the remains of a nineteenth century "highway" and village shielded from the modern intrusions of life. Seemingly abandoned today, Waterloo Village in Byram Township, New Jersey was once a bustling community important to New Jersey economically as an industrial village and later a commercial center. Renewal in the 1960s brought good fortunes and a bit of Williamsburg to northern New Jersey. But as with each revival, there is a cyclical downward spiral. Waterloo Village has seen a few during its history, but once again, hope gleams again thanks to the work of volunteers and organizations that seek to not let the spirit of Waterloo fade away one last time. For more than twelve thousand years, the area of Waterloo was home to the Lenape Indians and their ancestors. In the eighteenth century, European settlers pushed them westward. The discovery of iron ore led to the construction of Andover Forge in 1761 on the bank of the Musconetcong River in present-day Waterloo, seven miles southwest of Andover Furnace, to refine pig iron into iron for industry. Andover Furnace and Forge processed high-grade ore from the famous Andover Mine, considered the most extensive hematite deposit in New Jersey. During the Revolutionary War, the Forge was confiscated from its Loyalist owners for a period of three years beginning in 1778 by the Board of War and used to make armaments for the Continental Army. The Andover Ironworks closed in 1795 due to heavy deforestation during the prior decades. The wood in the surrounding forests was burned into charcoal which fed the forges, but no plan had been considered for their replacement. The site lay barren until a local charcoal-burner, John Smith, of Roxbury, purchased the abandoned 282-acre Andover Forge Farm (Waterloo) on November 30, 1812. Needing an efficient way to transport anthracite coal from Pennsylvania east to the New York City area, George McCulloch, of Morristown, floated the concept of a canal across mountainous northern New Jersey. The Morris Canal and Banking Company was incorporated on December 31, 1824 by the New Jersey State Legislature. 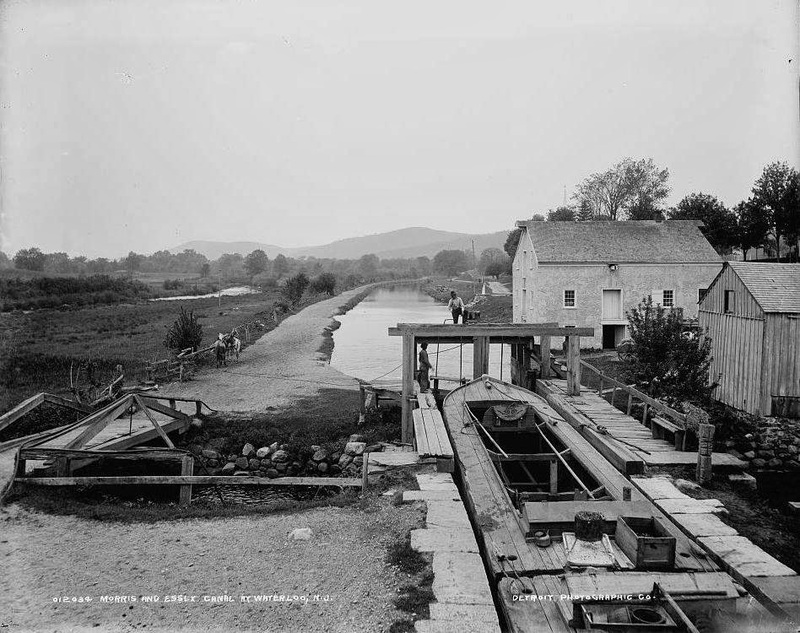 Construction on the canal began in 1825 and work was completed six years later, at an estimated cost of $2,104,413. Once completed, it stretched across New Jersey from Phillipsburg to Newark. It was extended to Jersey City in 1836, making the canal 109 miles long. It was the most unique of America's towpath waterways. Designed to carry coal and other goods from the Lehigh Valley to New York harbor, it utilized a series of twenty-three water powered inclined planes along with thirty four locks (including tide locks, guard locks and feeder locks). The Morris Canal at Waterloo Village, circa 1890 - 1900. The original design of the canal allowed for boats of 25 tons. By 1860, the canal had been progressively enlarged to allow for boats of 70 tons. Traffic reached a peak in 1866, when the canal carried 889,220 tons of freight, equivalent to nearly 13,000 boat loads. At the Smith Farm (Waterloo), an inclined plane was to be built, offering John Smith an ideal situation. The inclined planes were generally bottleneck areas, meaning that often men would be waiting in "traffic" at the bottom of the plane. Smith, who had two sons, Nathan and Peter, used the opportunity before him to his advantage. A stone storehouse on the edge of the Morris Canal and a large stone grist mill on the foundation of the original charcoal house were built in 1832 and the old Forge Master’s Dwelling was converted into a tavern in 1837. Nathan converted an old stone barn of the Andover Iron Company into a home for himself. Peter and his father would live in the Homestead House, one of the oldest buildings at Waterloo. The original portion of this stone structure dates to 1760, when it was a part of the Andover Forge. It was expanded at some point between 1770 and 1780 and became home to the Smith family shortly after the property was purchased in 1812. John and son Peter lived there throughout much of the nineteenth century. Sometime between the 1860s and 1870s, Peter added a rear addition and matching projecting bay windows connected by a wide porch to the front. The Homestead House at Waterloo Village. The Smith family operated a successful canal store and numerous homes were built to house employees of the Smith's mills and for the operation of the canal. Barns were located toward the rear of the properties and in 1869 a Methodist church was built with funds donated by Peter and Samuel Smith, James Ayers, and Samuel Stackhouse. This new building replaced an earlier stone schoolhouse built in 1842, which was deemed inadequate for worship. Most notable of all the homes at Waterloo is the Peter D. Smith home, built in the Second Empire style in 1874. Built on a gentle slope, this massive three-story, boxy home features a fourth floor cupola, mansard roof, four chimneys, and two projecting bay windows on the first floor. It was built by Peter D. Smith, son of Peter Smith. Born in 1845, Peter D. worked in the family store and mills at Waterloo. In 1874, Peter and his brother Seymour bought the store and mills from their brother Samuel. The two brothers successfully continued the family businesses until they were sold in 1897. The now-abandoned Peter. D. Smith Home. Between 1876 and 1878, Seymour built the Seymour R. Smith House on the family property. This home was built in the combined architectural styles of Queen Anne and Italianate. He and his family lived in the home until he moved to Hackettstown in 1897. In the 1920s, Seymour proposed turning Waterloo into a lake resort community, but the onset of the Great Depression abruptly ended this plan. Waterloo's importance diminished after the southern terminus of the Sussex Branch of the Delaware, Lackawanna & Western Railroad was moved to Stanhope in 1901. The canal's traffic quickly declined, as railroad became increasingly cheaper, quicker, and operated year-round, unlike the canal which shuttered operation during the winter months when the waters froze. In the early years of the twentieth century, the Morris Canal maintained a skeleton crew and the canal was finally abandoned in 1924, isolating the remaining buildings at Waterloo. Time has taken its toll on many of the buildings at Waterloo Village. Beginning in the 1950s, Waterloo was once again rediscovered by Percival H. E. Leach and Louis Gualandi, partners in a New York firm of interior designers. Together, they initiated a gradual and on-going restoration of Waterloo Village. Eventually, Waterloo Village was added to Allamuchy Mountain State Park and the restored Waterloo Village opened to the public in 1964. The buildings were fully furnished to reflect the period, interpreters walked the paths, the grist mill operated, and the canal store sold crafts from the village's talented artisans. The Waterloo Foundation for the Arts, a not-for-profit corporation, was established and enabled Leach and Gualandi to raise the funds necessary to not only restore the village, but also to expand its operation to include classical and pop concerts that brought in additional revenue. By the mid-1980s, Waterloo had become a regular stop for performing artists and was envisioned as the New Jersey equivalent of Tanglewood, with a proposal that an amphitheater would open and would become the summer home of New York's Metropolitan Opera. However, the amphitheater was never built and the organization suffered a loss after Gualandi's death in 1988. After his death, the organization was involved in a questionable "land-swap" and eventually Leach was removed from the leadership. In the 1990s, a new management team was brought in and events were downsized. At their height, some rock concerts brought as many as 20,000 to the Village, which overwhelmed local roads and services. 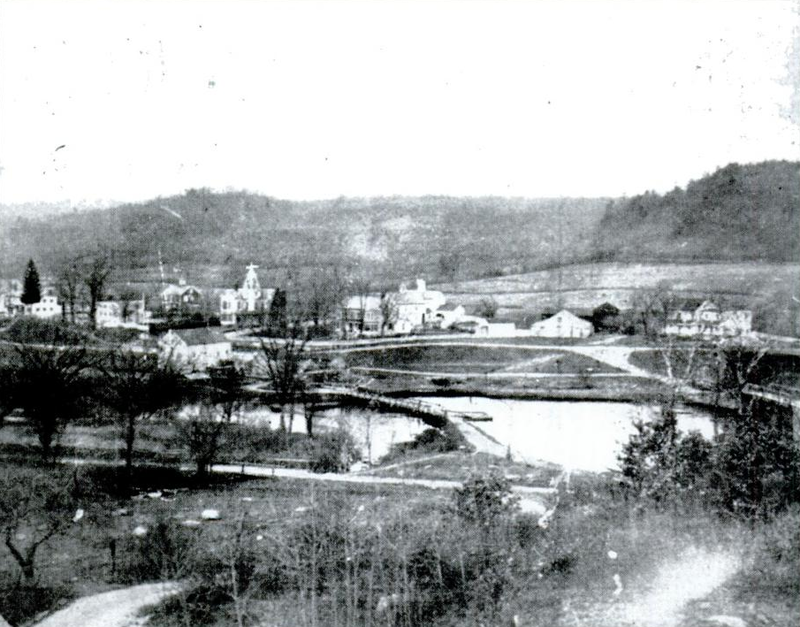 A view of Waterloo Village from the top of the inclined plane, circa 1907. In the 2007 New Jersey state budget, Waterloo Village was not included and in December 2006 Waterloo Village was shut down. Between 2007 and 2008, the Village was opened intermittently for events and the Methodist Church on the property continues to operate as it has done for the past 150 years. But most of the village structures have suffered from a lack of preventative maintenance over the past twenty years. The Canal Society of New Jersey took an interest in Waterloo, restoring one of the homes as a museum building. Partnering with the New Jersey Department of Environmental Protection and the State Park Service since 2006, the Society has organized the increasingly-popular Canal Heritage Days at Waterloo, encompassing seven Saturdays throughout the summer and fall each year. Visitors can expect to experience a working blacksmith shop, the mill, village store, numerous interpreters, and live music. In 2013, through a concession agreement with the New Jersey Department of Environmental Protection, Division of Parks and Forestry and Winakung at Waterloo, Inc., group tours and programs were once again made available at Waterloo Village. Another non-profit, Friends of Waterloo Village, has been formed with the hopes of raising awareness and funding to restore additional buildings on the property and restore the Village to its former glory. Good stuff. Thanks for sharing. Love the pix.